I’ve often joked that if one was so inclined, one could create a film geek drinking game occurring whenever director and film scholar Peter Bogdanovich pops up on a classic movie special. While Bogdanovich, like most directors, does love an excuse to “toot his own horn,” he’s also an affable movie buff, a genuine fan that has some really fascinating tidbits of information to share, given his extensive interviews and acquaintances with classic stars. Over the years, I've felt that he's become a favorite non-professor of film studies in my college pursuits. Sure, there’s the tendency to name drop but one name he drops most often and with good reason is Orson Welles. Welles, the film director’s director—that Citizen Kane boy genius who gets more legendary with each passing year, found himself in near obscurity by the end of his career. Disrespected and second-guessed by studios, Welles spent his time drinking in bars and forgotten, Bogdanovich (that always ready eager beaver boy scout) befriended Welles and even shared a residence with him for a while to get him back on his feet. They had a fascinating Tuesdays with Morrie type of friendship—a mentor/student rapport that Bogdanovich has talked about ever since and sure enough, there he is at the beginning of the video restoration of British director Carol Reed’s masterpiece The Third Man (less remembered for Reed than Welles, of course). In the film, based on a brilliant story by Graham Greene, Welles plays Harry Lime, the best friend of the main character. For most of the film, set in post WWII Vienna, we assume (like our writer and amateur detective hero Joseph Cotten) that Lime is dead. Welles had what he called the ultimate “star part” since every character discusses Lime for most of the film before he even appears, building up that classic Welles ego and he’s able to make one of the grandest of all film entrances. Shot in black and white, the “actor’s best friend” according to Welles who believed there were no good performances in color (since one is too concerned with external rather than focusing on raw emotion), the film is visually stunning. To quote "The Ultimate Encyclopedia of the Movies," the film represents “one of those rare instances when a clutch of fiercely independent talents mesh to create an organic whole,” (207). The whimsical music, the memorable dialogue (including Welles’s brilliant, improvised cuckoo clock speech), and the lush cinematography (just try to forget that ending that no doubt inspired New Wave filmmakers) “burn into the mind’s eye with an intensity that’s startling,” ("Ultimate Encyclopedia"). In addition to a masterpiece of noir, the film is also one of the better literary adaptations of the genre and thus fulfilled Graham Greene’s “long-standing desire to make an effective thriller that also functions as an art movie,” according to James Naremore’s book "More Than Night" (77). 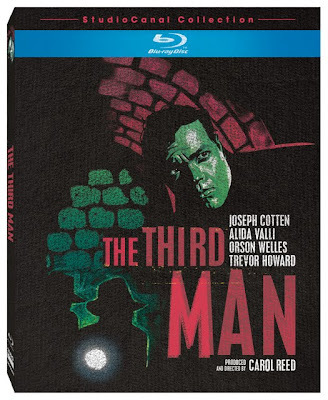 * Note: In September, 2010 a Blu-ray version of The Third Man was released by Lionsgate and Studio Canal in the model of previous Criterion Collection releases. Despite a horrible soundtrack that makes it exceedingly difficult to make out the world-famous dialogue (and absence of English subtitles to assist), the picture is visually pristine and sharper than ever. Touch of Evil is widely known as the last film noir of the classic Hollywood era. The genre had slipped from popularity in favor of escapist films or status quo pictures that the post World War II era favored, now that the boomers had settled into the suburbs. Moral questioning fell out of favor and such is the case with Evil, a film mostly ignored during its American release (partially due to the studio that chopped the work away from director Welles’ original vision to pander to the masses, prompting a 58 page memo in response). In France, the film was huge, winning an award at the Cannes film festival and the work has regained popularity here in its homeland as it’s now “considered a Welles masterpiece whose technical brilliance and thematic depth bring it close to the stature of Kane,” according to David Cook’s "A History of Narrative Film" (418). The film was originally set to be a conventional police drama but star Charlton Heston insisted that Welles direct and gave him a chance to rewrite the work as well, calling Welles the “most talented man I ever worked with. Indeed, ever seen,” as referenced in "The Ultimate Encyclopedia of the Movies" (217-218). Welles turned the film into a “tale of corruption of Shakespearean standards” (Ursini and Silver's "Film Noir," 169) with a legendary opening sequence shot in high contrast black and white in a single tracking sequence that lasts for over three grueling minutes of scene changes and moods. The script, in Welles’ hands changed from a simple tale of cops and villains to “a nightmarish parable of the abuse of power in a dark and sinister world,” (Cook, 417). Still quite tough to watch, all three hundred pounds of Welles portrays a corrupt police officer whose methods are brought under scrutiny by moral good guy, Mexican officer Heston (yes, Heston plays a Mexican!). During the course of the film, which in classic Welles fashion ends with an irony that despite Welles’ horrendous methods he knew the culprit of the opening crime, Janet Leigh’s sweet bride of Heston undergoes torment of a group of bandits that’s still guaranteed to shock as much as her famous Psycho shower scene. The ending of the film has been made famous by John Travolta’s character in Get Shorty who acts out all of the roles as a spectator in a revival showing of the film and I caught myself hearing Travolta’s voice overlapping with Marlene Dietrich’s in the last few lines. Summed up best by "The Ultimate Encyclopedia of the Movies," Touch of Evil is a “lavish feast of baroque imagery, a rougish essay on law and disorder and the last great picture Hollywood’s aging boy-wonder was ever able to make.” Although he didn’t say that himself, I’m sure Peter Bogdanovich would have to agree.